Hershey altered its hiring policies when needed. Employment guidelines were often overlooked and ignored when the need for employees was great. During World War II Hershey experienced a significant shortage of male employees as most men enlisted or were drafted into service. Women and teenagers who were often underage were hired to fill those vacancies. Even though he was underage Bill Cagnoli found work as a bellhop at the Hotel Hershey. Well, I remember I took a job during World War II. There was such a shortage of workers during World War II in Hershey, that at the age of 13 and a half or 14, I went to the Hotel Hershey to be a busboy and a bellhop. Even though you had to be 16 and have a working permit, Hotel Hershey hired me because they were so desperate for help. As tall as I am now, that’s how tall I was when I was 14 and 15. I didn’t grow from that age on, you know, but I was very tall. So anyway, they saw how tall I was and big I was. They assumed I would pass for 16. They falsified my age, or I falsified it, or however. We didn’t even put down the age. Sometimes Hershey employers ignored age restrictions when they knew that the family need was great. Hershey was a small town and the public school and Hershey Chocolate Corporation often cooperated with each other helping students find work. Sam Tancredi, whose father was an invalid, began working part-time to help support his family when he was only 8 years old. With the help of the School District he left school at age 15 to take a full time job at the chocolate factory. It was mostly through the efforts of Mrs. Murrie, the wife of the then President of the Chocolate Company, that I obtained a job. 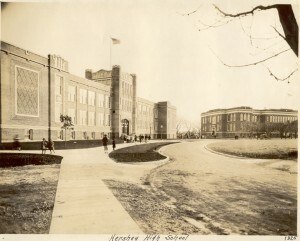 Apparently, she had become aware of the family need and stepped in to help… On April 16, 1929, my 15th birthday, [Mr. A. M. Hinkle], the Principal of our school, called me into his office and told me that he was happy that I was 16 years of age and could get a working permit so I could go to work to help the family. I said several times that I was 15 years old, not 16, but he paid no attention to me.